Lego - not just for kids - Let's keep that in the sanctity of your brain, shall we? There was also a Captain America and a Thor, which I'll grab next time. Iron Man even comes with his little robotic helper, so cool. Not sure why The Hulk has an assault rifle though. That is a definite probability! No doubt they were about to shoot Tony too. Not sure why The Hulk has an assault rifle though. 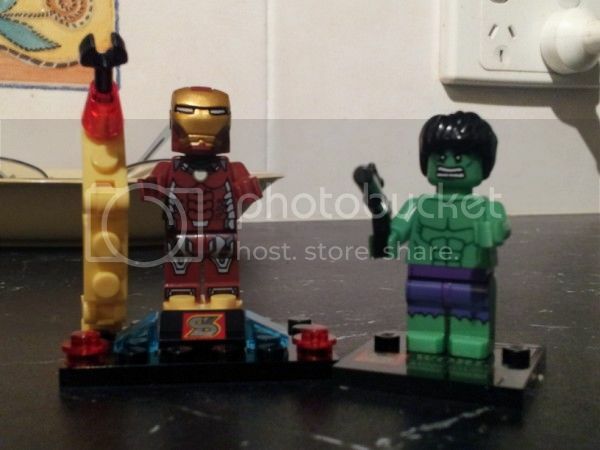 Because little kids like their toys to have accessories and what are you going to give the Hulk? Also, as far as toy manufacturers are concerned these are boys' toys so the obvious answer is a gun. They're in good company, being flanked by Optimus Prime, a ninja turtle, and Bilbo all riding My Little Ponies on one side, and the fourth, fifth and eleventh doctors plus a cyberman on the other. So far they're all playing nicely.